The areas east of Suiranjandas road have relatively narrow roads & except for CV Raman Nagar, most of the areas are poorly served with infrequent buses resulting in long waits for commuters. With the introduction of Big-10 buses, there is a chance to revamp & improve services & connect these dense areas better with minimum no. of buses & routes. Only one additional change at either Old Airport road bus stop (near HAL Police Station) or Old Madras road (Byappanahalli) will be necessary, from where commuters can transfer to Big-10s or other buses or on to the Metro at Byappanahalli, when it becomes operational. There are too many bus terminuses within this area since dedicated (destination-oriented), but infrequent services were being provided to the various isolated locations wherever possible. Lines marked in Magenta are narrower sections of roads with no bus services. Of the three sections of these roads with no services, it is possible to run buses on one of them (stretch between Vignan Nagar bus station & Kaggadasapura bus station). Buses to & from CV Raman Nagar use the wider DRDO township road/s & hence, operation of even a Volvo service (201R) has been possible. It is suggested that instead of operating several routes (eg. variants of route no.314, 330, 333, BTP buses, etc.) from city center/s to these various scattered & isolated destinations, the no. of routes & bus terminuses be minimized & through services provided as best possible. Since some of the roads are narrow for large buses, it may be better to use the smaller Swaraj Mazdas or Tata Starbuses (depending on availability within BMTC’s fleet). Private buses are already running on these roads (operated by TCS, various School buses, other private company vehicles, etc.). Map-1 shows a possible track for Route-1 via the existing Basavanagar Bus station, Vignannagar bus station, Malleshpalya bus station, Jagadish Nagar bus station, BEML gate & LRDE /Bagmane Tech park (BTP). This route will serve all the inner areas mentioned to reach either end efficiently as also enable people arriving from Marathalli /Whitefield side & from Byappanahalli-OMR to reach BTP /LRDE & CV Raman Nagar areas with only one change. Map-2 shows a possible track for Route-2 via Basavanagar, Vignannagar, Kaggadasapura, CV Raman Nagar, DRDO & BTP /LRDE. This route will serve the inner areas mentioned to reach either end efficiently & also connect people from Old Airport road & Byappanahalli-OMR to these areas. Map-3 shows a possible track for Route-3 via HAL factory, HAL hospital, BEML gate, Malleshpalya, Vignannagar, Kaggadasapura, CV Raman Nagar, DRDO & BTP /LRDE. This route will serve the inner areas mentioned as also areas along Suranjandas road & connect BTP /LRDE & CV Raman Nagar. Though this route is somewhat roundabout, the benefits are connectivity for people directly from Old Airport road & OMR /Byappanahalli to most of the internal areas in one single circuit as also provide a service for commuters from Suranjandas road to these areas. The existing destination-oriented route to LBS Nagar from Old Airport road is an exception here & will have to continue with the existing frequencies as there are no proper roads to run services past it & connect with the other routes. Additional services past BTP /LRDE up to CV Raman Nagar bus station can continue to operate with larger buses as loads may be high, but dedicated BPT /LRDE services can be reduced since all these new routes pass through them. All the inner areas will become connected more frequently with fewer buses. Utilization & ridership on Big-10s on OMR & Old Airport road will improve as a result. Exclusive services to the various scattered small bus terminuses (except for LBS Nagar) can be done away with since these routes will cover all of them. The various bus terminuses can be utilized as formal bus stops & for other useful public services & parking of buses at night. Old Airport road (near HAL Police Station) will be connected very well with Old Madras road (Byappanahalli) & enable commuters to move much more easily between these two important transfer points. This will prove very useful in the future when the Metro becomes operational (Separate, direct services to Byappanahalli from Old Airport Road along Suranjandas road may also be necessary at that time). Even if only three buses are assigned for each route & if trip lengths are assumed to be approximately 30-35 minutes, the frequency will approximately be once each thirty minutes – much better than the 1.5 hours or so presently. If four buses are assigned per route, the frequency will improve further to about a bus each 20 minutes. Since bus routes overlap with one another along some main roads within the area, frequencies will be higher on these main roads & will benefit commuters greatly. Crossing over to Tippasandra, Marathahalli? Why not extend the routes to run "8" pattern and stretch into Tippasandra and (north of Marathahalli)? SB - What you suggest may be possible for Tippasandra (buses already run on Jeevanbhimnagar road & Tippasandra main road + Indiranagar 80 ft road), but the route lengths for last mile connectivity will become too long for all these areas if too many areas are included. Further, Jeevanbhimnagar has a larger bus terminus /depot & has many services already in operation that connect it with both, Old Airport rd as also OMR & the need for such services may not be felt so much there. I doubt if areas north of Marathalli can be linked in these circuits because of the absence of proper connecting roads (other than OMR & Old Airport Road). The roads that link up to ORR is the one from DRDO 2nd phase (Kaggadasapura bus stn) to ORR, but this road is too narrow beyond DRDO 2nd phase & I doubt if it can handle even vans, let alone buses. A different circuit can possibly be organized to include Jawahar nagar from Old Airport rd to ORR & also include areas north of Marathalli, but this will cross ORR. Hence, it may be better to connect the areas north of Marathalli only to ORR (I think there are sufficient services on ORR). Excellent idea, Naveen. I think Map-2 would provide the best route. Map-3 seems too circuitous to be viable. However, I feel these routes should run upto BYPL station on the OMR side (to provide connectivity to the Metro when it opens) and upto Marathahalli on the Old Airport Road side (to provide connectivity to the ORR). One correction - the magenta road from OMR Big Bazar to C.V. Raman Nagar is wide enough for buses to operate - I have seen a BMTC bus (and numerous private ones) use that road while I visited Big Bazar. Finally, what is your opinion on a circular/ring service - originating/terminating at the proposed Metro terminal, then running via Big Bazar - C.V. Raman Nagar - Kaggadasapura - Vignananagar - Basava Nagar - Old Airport Road - H.A.L. - Suranjan Das Road - B.E.M.L. - Bagmane Tech Park - N.G.E.F. - Old Madras Road ? Also, a similar service in the reverse as none of these roads are one way. BMTC could use its Swaraj Mazdas here. The road adjacent Big Bazaar is wide till it reaches Nagavarapalya, where it narrows - Swaraj Mazdas can go through, though. The buses you may have seen might have been sometime ago - I think these have now been stopped due to the narrow stretch. Private company buses & school buses continue to operate on almost all the marked roads, though. The circular route you propose is reproduced on the map below. This is also a great idea, the only weakness is that it does not cover the stretch between Vignannagar & BEML. Actually, any route or a combination of routes that cover all the points would be better than the present destination-oriented service/s. The service/s can easily be extended till Marathalli-ORR, but the congestion there is a big problem & will involve delays. BMTC has recently introduced feeder routes 504E & 504F (two bus schedules each), one clockwise & the other anticlockwise, with route shown below. The routes cover KR Puram, Hoodi, Graphite India, Kundalahalli, Marathalli, HAL Museum, Basavanagar, Vignannagar, CV Raman nagar, Bagmane tech park, NGEF-Byappanahalli. These routes will be useful for those residing between Old airport road & Old Madras road. Also, once Metro begins operations, it will be a good feeder service for these areas as it connects a fairly large area to Byappanahalli. I have been trying to use this bus for quite some time now. I work near ESI Hospital on Old Madras Road. I need to go towards Marathahalli. There are different ways to get onto a volvo. 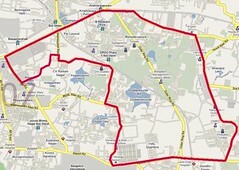 3) Walk till Graphite India (around 2.5km) and get on a 500 series volvo. Of this, Old Madras Road is frequently blocked. Time to reach KRPuram varies anywhere between 15 minutes to 35 minutes depending on the traffic condition. When u get on to 500k at ITPL, the distance from ITPL to SAP labs takes more than 20 minutes (heavy traffic). So, most of the time, I prefer walking to Graphite India and get on to a 500k. When 504E was introduced, I was happy, since that offered me the perfect solution for this stretch. I can get on 504E and change to a 500k somewhere between Graphite India and Marathahalli. I can reach Graphite India in 5 minutes (+waiting time for the bus). But, after trying to use the bus so far, here is what I have found. Since the bus is very infrequent as of now, being on time becomes more important. But, due to traffic conditions in bangalore, this is not quite possible. The variance on the Old Madras Road affects the bus as well. The bus comes to the ESI stop anywhere between 5.10 to 5.30. But the bus driver tries to keep the time at Graphite India stop constant around 5.30-5.35. In case he reaches earlier, he stops midway between these two points and wait till 5.30 to continue with the journey. I guess this is good for people who travel from ITPL area to CV Raman Nagar etc sinc eit reduces the variance there. I understand that in a circular route, this waiting has to happen somewhere. But, I am wondering if it is possible to do somewhere else, such that it disrupts some part of the route where it overlaps with more frequent routes! Anithasunil - would not 504F (operating in opposite direction) be more convenient & direct ? As far I understand 504F reaches Marathahalli after going through KRpuram, CV Raman Nagar etc, through airport road. I thought that was a little circuitous route to reach marathahalli. Have been meaning to write myself. I think 504F has been on for close to an year now, and is the kind of route that bridges "hinterlands" with trunk routes. Pulls people out to OMR, ORR, Old Airport Road, and two big Hubs - Marathahalli, K R Puram, besides the Metro station, which may be the long term purpose of this route. With more feeder routes, I think it would be time for BMTC to start issuing regional Bus route maps. IS there a way of making routes like 504F truely circular? As of now, if u get in from somewhere on old madras road, u have to get down at KRpuram, since that is the last stop. U dont have the option of continuing to CVRaman Nagar.